Agincourt600 – Commemorating 600 years since the Battle of Agincourt » Did Henry V take guns with him on his campaign of 1415? Gunpowder weapons originated in China and had reached Western Europe by the early fourteenth century. One of the earliest depictions of a gun can be seen in a manuscript presented by Walter de Milemete to Edward III on his accession to the throne in 1327. Edward III later made use of guns at the battle of Crécy (26 August 1346) and the siege of Calais (4 September 1346-3 August 1347). Royal artillery was constructed at the Tower of London and had become an essential weapon of siege warfare by the reign of Henry V. Henry’s first experience of using guns occurred when he was Prince of Wales whilst fighting the rebels of Owen Glendower in Wales. 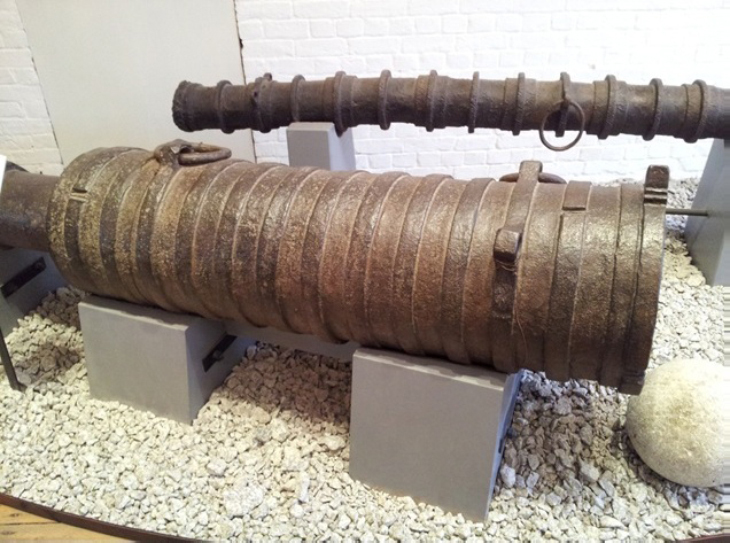 These weapons were liable to break under the strain of firing, however, as can be seen by the large bronze gun called ‘Messenger’ which weighed 4,480lbs and which broke during the siege of Aberystwyth Castle in 1407. Despite, or perhaps because of this negative experience, Henry made great efforts to obtain guns for the 1415 expedition. This included the purchase of 18,000lbs of iron for the construction of guns in the Tower of London and 10,000 ‘gunstones’ which were to be used as ammunition. A set of accounts submitted by Gerard Sprong in 1415 reveals some of the artillery available to Henry in that year. The document is preserved in the National Archives in Kew, reference E 364/49 membrane C dorse. This included five large guns called ‘Clysf’, ‘Fowler’, ‘Bristol’, ‘George’, and ‘God’s Grace’. We can expect that at least some of these weapons were used at the siege of Harfleur (13 August-22 September). The English artillery caused considerable damage to the town during the siege, which was a factor in encouraging the town to surrender to Henry. The guns and many of the gunners were left behind at Harfleur after its capture and they did not take part in the battle of Agincourt. Henry V later made extensive use of artillery in his conquest of Normandy from 1417 to 1419. Examples of surviving guns from the fifteenth century onwards can be seen at the Royal Armouries in Fort Nelson, near to Portsmouth.